Tonight's tea came about because Emma bought some dressed crab during her trip into the city centre this afternoon. I started off by thinking that crab goes well with both chilli and basil. I originally considered crab and chilli pasta with a basil oil drizzled on top. I then thought I like crabcakes but haven't had any for a while. 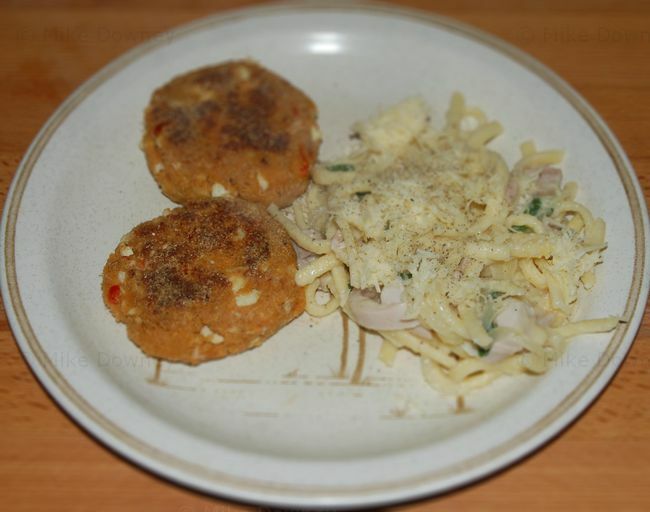 Tea then became crabcakes (flavoured with onion, chilli and garlic) served with noodles and a basil oil. The dressed crab was in a tub with brown crabmeat mixed with mayonnaise at the bottom and white crabmeat with chopped hard boiled egg on top. I mixed it together with 2 finely chopped chillies and 2 sliced garlic cloves. I then added a beaten egg and enough breadcrumbs to bind everything together. 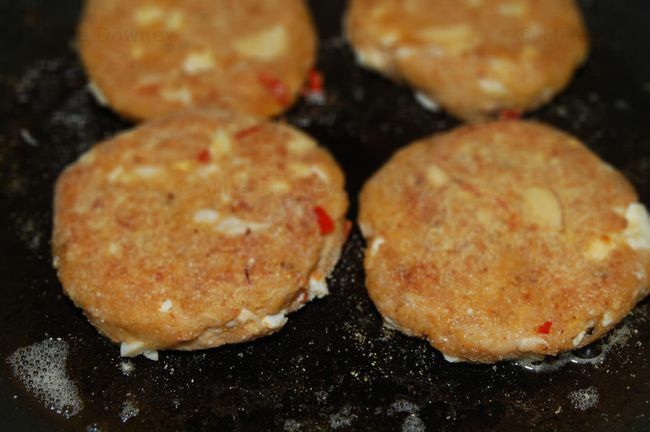 I shaped the crabcakes into small 'burgers' and coated them in cornmeal. I fried them in a little oil for 10-15 minutes while I prepared the spätzle. While the spätzle cooked I fried 1 sliced medium in a little oil until it had softened. We had a small amount of cooked chicken leftover in the fridge so I added that too. I shredded a handful of basil leaves and grated about 100g of cheese and set them aside for later. When the spätzle was cooked, I drained it then mixed in the onion, shredded chicken, shredded basil and half the cheese. The rest of the cheese was sprinkled on top.